Background Hospital pharmacists can make a considerable contribution to the spontaneous reporting system of adverse drug reactions. The factors that influence adverse drug reaction reporting among hospital pharmacists remain largely unknown in China. Objective This study aims to identify factors that affect hospital pharmacist-led adverse drug reaction reporting in Xi’an, and to obtain suggestions from pharmacists about how to improve the current adverse drug reaction reporting system. Setting Hospital settings throughout Xi’an, a region of Western China. Method A matched case–control study was conducted on a population of 2,814 hospital pharmacists in Xi’an during 2011. Cases included all pharmacists who had reported at least one adverse drug reaction between 2008 and 2010 and agreed to participate in the study (186/204; 91.2 %); controls (n = 372) were pharmacists who had not reported any adverse drug reaction during the same period. A self-administered questionnaire was distributed to the participants. Logistic regression was performed to evaluate the association between indicator variables and the outcome of having reported at least one adverse drug reaction. Main outcome measure Pharmacists’ knowledge, attitude and practice towards adverse drug reaction reporting and factors affecting reporting. Results Higher professional title (adjusted OR 1.44; 95 % CI 1.07–1.94; p = 0.018), having received training about adverse drug reaction reporting (1.64; 1.04–2.57; p = 0.032), better knowledge about reporting (1.53; 1.12–2.08; p = 0.007), “lack of access to adverse drug reaction reporting form” (0.29; 0.12–0.72; p = 0.008) was independently associated with adverse drug reaction reporting. 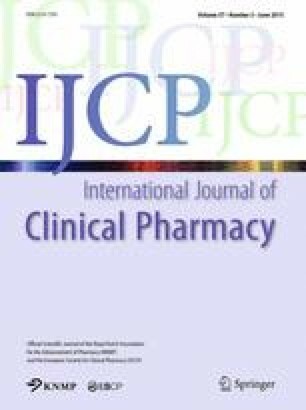 Clinical pharmacists were more likely to report an adverse drug reaction than dispensary pharmacists (1/adjusted OR 5.26; p < 0.001), pharmacy administrators (5.00; p = 0.003), and other technicians (5.56; p = 0.001). Conclusions Higher professional title, having received training, mastering knowledge about reporting, and being a clinical pharmacist were positive predictors of pharmacist-led adverse drug reaction reporting. Lack of access to reporting forms was a negative predictor. Continuous training and establishing incentive mechanisms are needed to promote adverse drug reaction reporting among hospital pharmacists. Zhongliang Zhou is co-first author. The authors thank all the hospital pharmacists who participated in this study. Statements made in this article are the sole responsibility of the authors. There are no other conflicts of interest. The Ministry of Health. Provisions for reporting and monitoring of adverse drug reactions. 2011. http://china-pharm.com.cn/News_View.asp?Newsid=183&Page=1 Cited 24 Dec 2014. China Food and Drug Administration. Annual report for National Adverse Drug Reaction Monitoring. 2012. http://www.sda.gov.cn/WS01/CL0051/79058.html Cited 25 July 2014. China Ministry of Health and State Administration of Traditional Chinese Medicine. Temporary regulation for pharmacy administration in medical organizations. 2002. http://www.moh.gov.cn/zhuzhan/wsbmgz/201304/c94ba546e18e488b9a1831d04c28d511.shtml Cited 18 July 2014. Tanzania Food and Drugs Authority. Guidelines for monitoring and reporting adverse drug reactions. 2006. http://apps.who.int/medicinedocs/documents/s18571en/s18571en.pdf Cited 10 Nov 2013.